As a bit of a follow up to a previous post, today I happened to catch the new gates at Young Road in action. This was a 98 car manifest, about half tanks with the rest being covered hoppers, empty lumber cars and a few box cars. It was west bound, and stopped for a moment east of this crossing to radio activate the switch before slowly entering Yeomans, so this was a Toledo bound train. This morning around 8:45 a train consisting of just WLE 6312 and WLE 4003 coupled to either side of a single covered hopper went west through Monroeville, kind of a funny looking thing. A couple hours later the same two engines returned, this time lashed together and pulling about 10 covered hoppers eastbound. I presume it was a run to Central SolBunge. Then around 12:30 another one of those NS powered covered hopper trains was leaving Bellevue eastbound, coming off the lakeshore track onto yeomans. It was the first one I've noticed in a while, and I still haven't seen which NS line those come from/go to. Bellevue_Guy wrote: This morning around 8:45 a train consisting of just WLE 6312 and WLE 4003 coupled to either side of a single covered hopper went west through Monroeville, kind of a funny looking thing. A couple hours later the same two engines returned, this time lashed together and pulling about 10 covered hoppers eastbound. I presume it was a run to Central SolBunge. From what I have read W&LE puts an engine on each end of their trains into Bellevue for quicker turnaround. That was they don't have to run around their train. It's good to hear they still have the Central Solbunge business. IIRC I read about that in Trains Mag a few years ago (4-5?) when the business just started. Around 300 cars a year was projected. A short haul IIRC (under 50 miles?). Tonight I saw one of those NS powered unit covered hopper trains coming into Bellevue WB on the WLE and decided to follow it, which resulted in me finally seeing which way they go and also seeing something kinda odd. As the unit rain was approaching the lakeshore connection another train was coming WB out of the yard, and to my surprise both kept going. Soon they were side by side on the NKP doing a "drag race" with the train from the yard leading by a few cars. I had been viewing this while driving over the 269 overpasses and I pulled ahead of them to slaughterhouse road, expecting to see the unit train go down the Sandusky district, but when I made the turn I saw two green lights on the Fostoria district. So I drove around slaughterhouse road to the Kinney Street crossing to wait for their arrival. As the train from the yard approached I was surprised to see that it was actually a Wheeling manifest lead by WLE 6349 & 6314. Soon both trains were passing at the same time, the unit train on the south track and the WLE on the north track. When the WLE cleared the crossing it stopped. 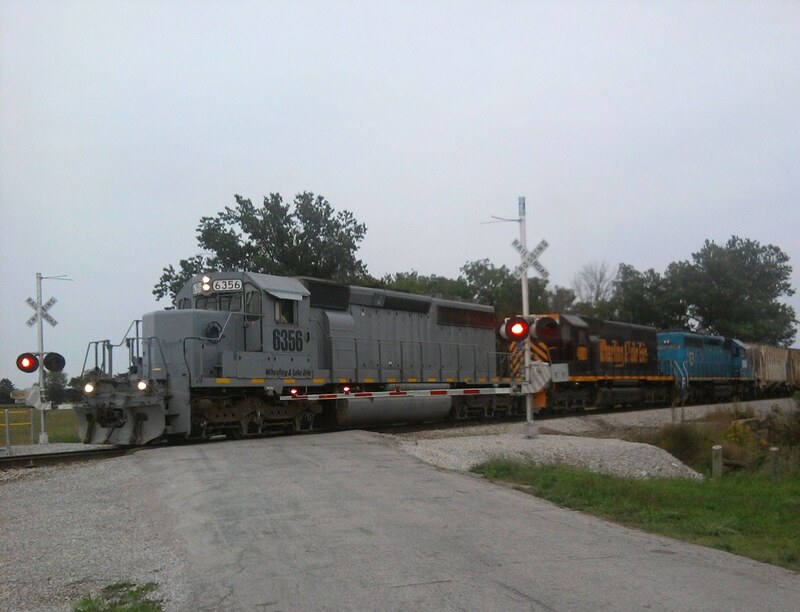 A little while later the much longer unit train stopped for about 3 minutes, blocking the crossing, then started again and left town WB on the Fostoria district. Then the WLE manifest started backing up, backed onto the Sandusky district, then pulled forward, went around the lakeshore connection and left town heading EB on the WLE. It had 25 cars. I don't know for sure why this happened, though my best guess is that the 2 crews swapped trains during that short period when they were both stopped. AARR wrote: From what I have read W&LE puts an engine on each end of their trains into Bellevue for quicker turnaround. That was they don't have to run around their train. Saw them doing it that way again yesterday, this time with 4-5 covered hoppers heading WB around the Brewster connection. Though I've also seen them do it with only one engine, by pulling around the Lake Shore connection out to either side of the New Haven, then backing all the way to Bunge, as documented earlier in this thread. Using 2 engines and the Brewster is a lot more fluid. Probably closer to 80 miles. They go to a Land O'Lakes plant between Massillon and Navarre. 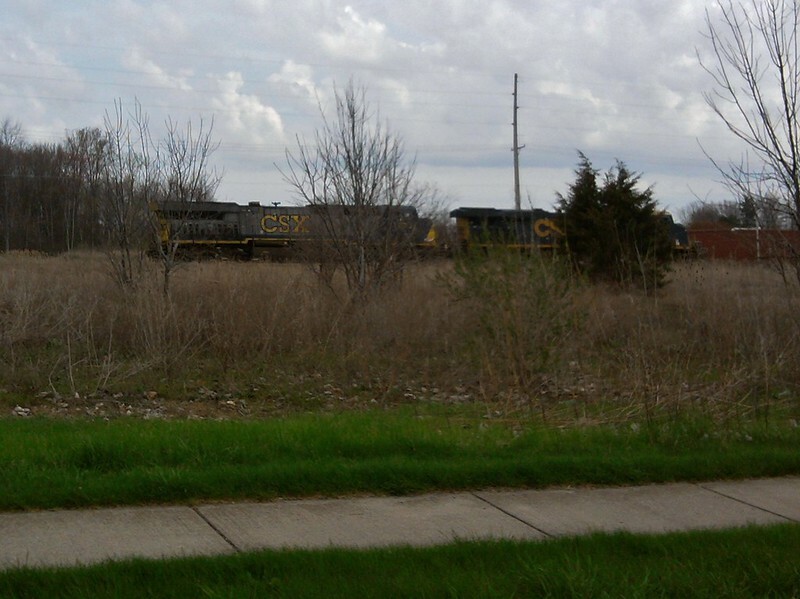 This morning I saw another one of those NS powered grain trains come off the WLE onto NS, though this one went south on the Sandusky district. It also had the NYC heritage unit trailing. I finally caught my first W&LE train! We were making our way westward across Ohio, planning on fanning from Lodi to Willard. We were a few miles east of Greenwich when we heard the wheeling get a track warrant from Spencer to MP74. Not knowing where MP74 was we followed the closer southern line back to Spencer and then the northern line to Wellington where we found the train waiting for a signal at the CSX diamond. It was a good catch with a Rio Grande tunnelmotor bracketed by a pair of SD40s. Chased them til they made it to MP74 and had switching to do. Does this train regularly run Sundays? Later when we made it to Greenwich we heard a Wheeling Z train with 62 loads of stone calling for permission onto CSX. CSX made them wait for a few trains and the crew outlawed. Train was left tied down west of Edwards Rd. 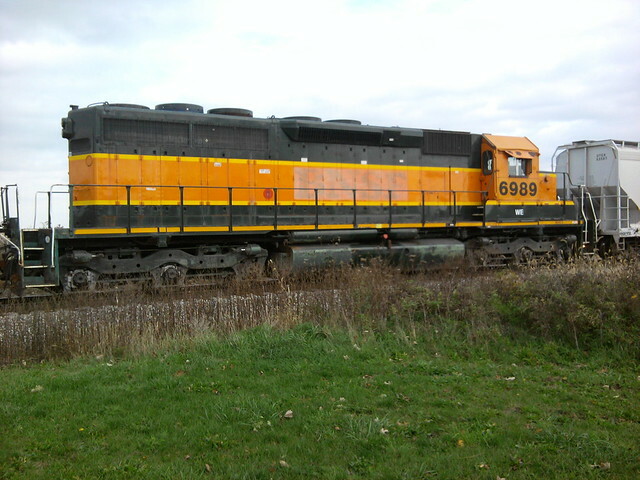 this train had a trio of SD40s. How often do they run the stone trains to and from Carey? Is it common to see them on Sundays here? Does the stone train also work the Ashland Railway interchange or do they run a local out here? alittlevanwerty wrote: How often do they run the stone trains to and from Carey? Is it common to see them on Sundays here? Does the stone train also work the Ashland Railway interchange or do they run a local out here? Trains Mag featured W&LE a few years ago. The info I am posting is from the article. It may be outdated now. Two stone trains a day depart west. One to Akron and the other to ??? (W&LE's main yard). Both will work Ashland interchange as necessary. A yard job makes up both road trains. I was walking on the NCIT today in Monroevile and lucked into seeing the Rio Grande tunnel motors. Here are a couple quick pics I took with my cell phone. This was part of a local train with power at both ends that switched out the factory off SR 547. The bottom pic is actually the first one I took, when the train was westbound and being lead by WLE 6384. The top pic was the eastbound movement with the Rio Grandes leading, presumably to the Hartland yard. The tunnel motors have been in and out of Bellevue a lot this year. I spent 15 minutes last Saturday trying to set up a good wide shot with my camcorder but ended up tossing it over the fence east of the bridge just as the 224 was coming across. Dang railing is a tad too high and the slats are too narrow! Nice catch!! W&LE has a lot of cool power! Gr8 shots...Berry Plastics is a good customer for the WLE..
- Williams Rd between Bellevue and Monroeville. I guess if Young Rd got gates, might as well do Williams as well, which could really use them due to a tree line obstructing the view from the south. - TR 41 on the Carey sub near Chatfield. Any time WLE puts gates on any random back road it makes me wonder why the crossing in Chatfield across state route 4 (aka the Cedar Point Super Speedway) only has lights. Also, here's a couple shots of one of the ex BNSF units that WLE acquired this year. These were taken 10/17 at Sand Hill Rd, where this train was sitting with no crew, while track work was being done a little less than a mile west of there. W&LE like their SD40's. They've tried the modern EMD's (SD90MAC convertibles IIRC) but unlike some other regionals who went for the modern power have decided to continue with the reliable 40 series. 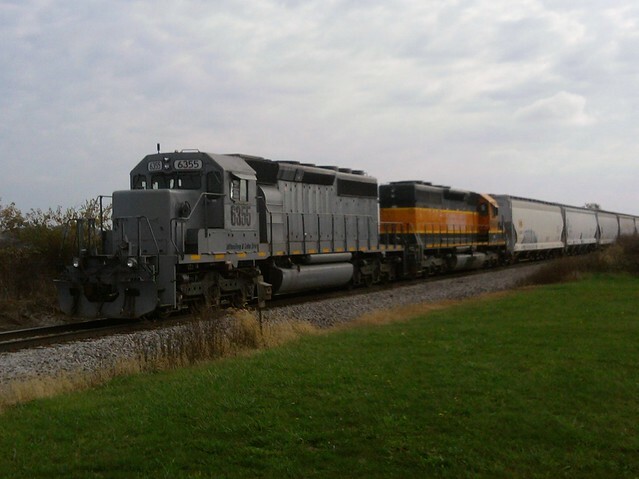 Saw something a little unusual on the Wheeling this morning in Norwalk, light power CSX units heading eastbound. The 4 way crossing at the corner of Jefferson and Newton streets in Norwalk recently had gates installed, but they have not yet been cut in. This morning I witnessed an eastbound stone train stop short of the crossing so that the crew could mark all 4 sides with flares before proceeding. Does anyone have an up to date list of W&LE train symbols with origination and destinations?